Let's talk prices and accessories and see which of these three fit our needs best. GRAND TOTAL: $455, by far the most expensive...but can you really resist that amazing folding technology? I'm not sure I can. 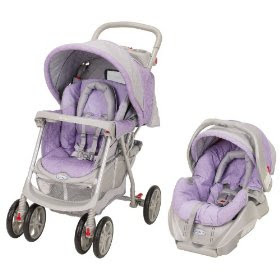 2)Graco MetroLite Travel System= $210. This is a classic, lightweight, 4-wheel stroller. It includes everything above minus a raincover. It is just as light as the City Mini, has extendable handlebars, and has an easy fold, though not nearly as easy or compact as the City Mini. 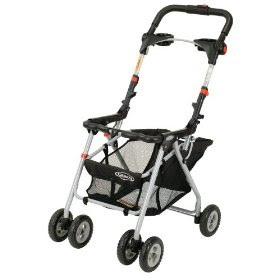 3)Graco SnugRide Infant Car Seat + The Graco Infant Stroller Frame for a grand total of $130. This, of course, is only a temporary solution since baby will outgrow the carseat in about six months, but comes with a big basket and extending handlebars and is lightweight. Seems like a good option, but waiting six more months means allowing myself six more months to obsess...and we don't want that, do we? And so there you have it. How much is that stylish stroller with that fabulous fold worth? An extra $200? I think it is. Hey Guys- we are looking forward to seeing you this week (we get in Thursday). I hope that all is well on your end. We used the Graco SnugRide Infant Car Seat + Base for Eliana and were very happy with it. It is really easy to use- you just drop it in the car-base and it automatically snaps in (its angled that way). You are going to need another stroller so I'd say go with the City Mini. I think that is what we would buy if we were to do it over again (we have the regular City). Hey Nafi (and Sybil), thanks for posting. I think we will go for the city mini in the end, even though menachem insists he's too tall. We'll try it out until pesach and if it really is too short, we'll sell it and get a different one or check out handlebar extenders. Does Eliana still fit in the snugride? or did she grow out already? How long does that car seat last? Btw, saw some pictures and she is so so cute! gracos are cheapy crap, the wheels go off in all directions when you push them (nightmare for heavier kid) and they tend to fall apart with months, not sure why americans insist on buying them (patriotism maybe?). Even if you end up buying a graco stroller go for a maxi cosi or britax car seat, they're more expensive but much better safety ratings. You're meant to keep your kid in the car seat for at least a year even if they're chunky, until their neck muscles can deal with forward facing impact. I would go for the city mini and a maxi cosi car seat, it'll last you more than 1 kid (puh puh puh) so will save you money in the long run. Alternatively use all the generous offers from parents/ grandparents and get a phil and teds and maclaren, and fulfil your stroller needs for life! Nomi, are you saying that the maxi cosi can hold a baby up to one year? it says 22 lbs. -- is that about one year old? Also, you're talking abotu the maxi cosi mico, right? I have a city mini and I LOVE it! I was also deciding between the maclaren and the city mini and I am so happy with my decision. It pushes so well and the fold is incredible. You can totally push the stroller with one hand and the sun shade is fabulous.The only problem is the basket is small and stupid- you can't get to it easily at all. The maclaren basket is pretty bad too.